IMT's campus is made up of several, state-of-the-art buildings all located minutes from each other within Lucca's historic periphery Renaissance-era walls. Advanced training and research at IMT are in fact fully integrated, thanks to the high quality of its services and underlying scientific infrastructure. Presently, the buildings that make up the IMT campus stretch over 10,000m2. The newest addition to the IMT campus is the San Francesco complex, inaugurated in July of 2013. The beautifully and painstakingly restored complex includes the San Francesco Church (to be used for major events), the Guinigi Chapel (for seminars and smaller events), the "Sagrestia" (for seminars and meetings), classrooms, residential facilities for students, short- to medium-term housing for visiting faculty, office spaces for faculty and staff, the canteen, and numerous internal and external areas for study and socialization. 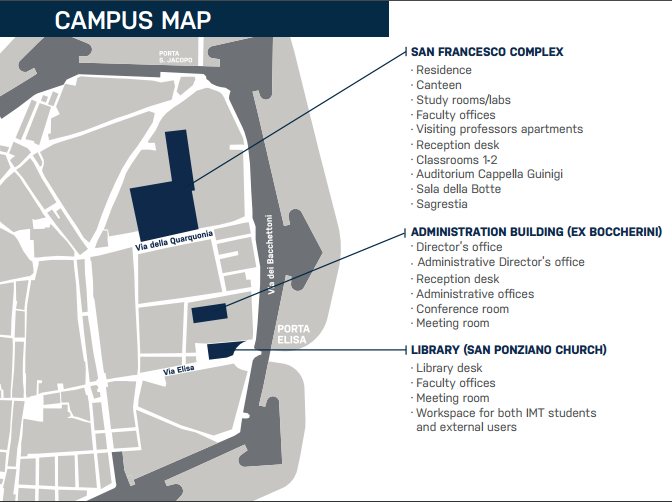 PhD students are offered free housing in the San Francesco complex and free access to the canteen. The central administration offices are located in the Ex-Boccherini building. The IMT Library, located within the restored San Ponziano Church, houses not only the Institute's collection of books and journals, but faculty offices as well. A portion of the San Francesco complex is open to the public, however you can also take a virtual tour of the new campus by visiting the photo gallery below. For those curious about the evolution of the restoration of San Francesco, you can also watch this video.